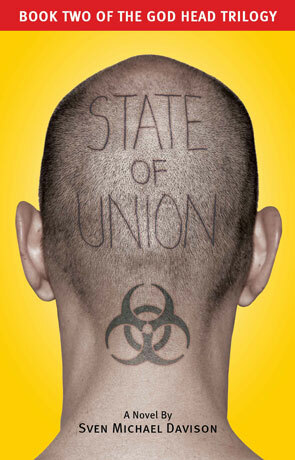 State of Union follows on from the events of the authors previous novel, State of Mind - a post cyberpunk novel that we reviewed back in February 2011. Jake has been living off the grid for five years and returns to civilisation to find a nano-virus pandemic known as MaxWell has killed millions of people worldwide. The only real cure for this highly contagoius illness is to be implanted with the P-Chip, a technology that Jake has been trying to avoid for all this time. As if trying to avoid this deadly illness wasn't enough, Jake has also been asked to hunt down his old LAPD collegue Joaquin Parks who now seems to be the head of a religious group accused of terrorism. Technology is continuing to evolve to new heights too, with the dawn of true Artificial Intelligence and with it the promise of digital immortality. I love the way Davison manages to inject a future reality over the top of our own present day, creating a believable future that is all the more sobering for it's credibility. Even taking this technology much further than he did previously - increasingly merging the artificial with the organic - it still maintains enough links to our present to remain shocking even when pretty much everything goes south. Jake has grown too and feels more of a well rounded human that the gung-ho hero he did in the last book (although he is still much more Bruce Willis than Bruce Forsyth). The pace is relentless and doesn't let up for the whole time, even on the last few pages the author is throwing more stuff at Jake and the actual ending is pretty sharp, set up and ready for the next book. It's actually quite frightening to think that most of the tech on display is becoming more plausible by the day while the social problems that escalate the story are pretty much already in evidence around the globe. The main theme is still very much about free will and the increasing erosion of societies civil liberties; taken here to the next level and the logical conclusion based on current trends. There is also a powerful message about the futility of one man trying to fight against a government - that David vs Goliath struggle. This is counter-balanced by the indomniability of the human spirit however in this volume it does very much feel like trying to survive despite insumountable changes rather than being able to influence those changes with the protagonist lurching from one disaster to another - a pawn moved about on a chess board. State of Union is a perfect continuation of the story that began in State of Mind, taking the plot to new heights and fine-tuning the rich characters while also running along at a great rate of knots. Science fiction as it should be. Written on 19th December 2012 by Ant.